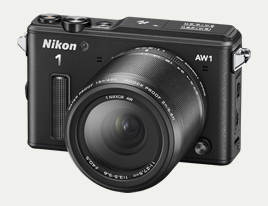 A fusion of smart sophistication, incredible toughness and world-renowned quality, Nikon 1 AW1 is equally at home uptown, downtown or when you just want to get away to the mountains or beach. A knock-around companion that's always with you, ready to preserve those snippets of life you won't want to forget. Just dive in and shoot. Nikon 1 AW1 is waterproof down to 15 m (49 ft) and able to withstand the inevitable bumps that accompany your undersea explorations. 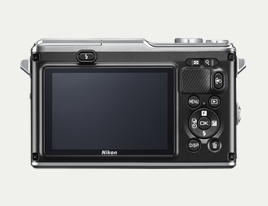 Plus, both the camera and its dedicated lenses are designed for super-easy operation in challenging environments. Impeccable quality you can feel. A totally cool camera you'll love to take everywhere. Meticulously designed to blend with any scene in unmistakable style, this Nikon 1 is your ticket par excellence to formal and fun occasions where high fashion and high quality go hand in hand. Action control and sensing functions. Shooting in less than ideal environments requires usability that extends to every facet of camera operation. 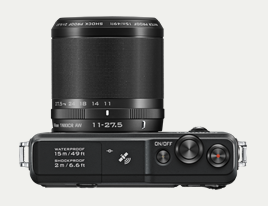 Nikon 1 AW1 delivers on all fronts with new Action control — a revolutionary new interface that makes adjusting as easy as tilting the camera. Even when wearing gloves or otherwise bundled up against the elements, you can quickly change shooting modes and play back settings. You'll also appreciate the wealth of sensing functions, including depth, GPS/GLONASS, altitude and more.